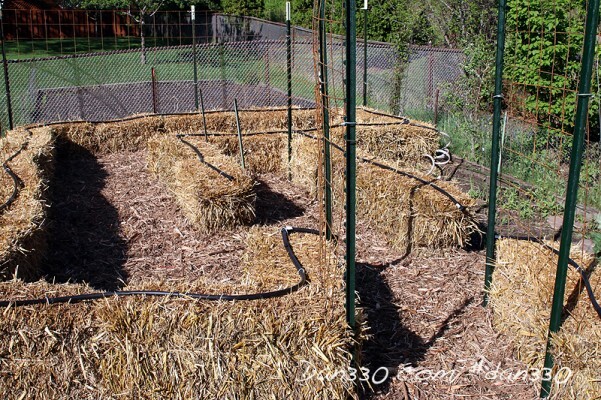 The straw bale conditioning phase of the garden is just under two weeks. 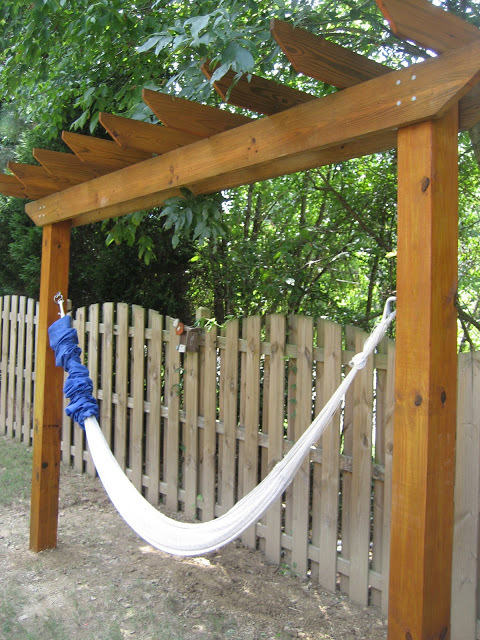 It is a great time to get all the other projects completed like the irrigation and trellis systems. The last project I wanted to complete was the bedding in-between the straw bales. 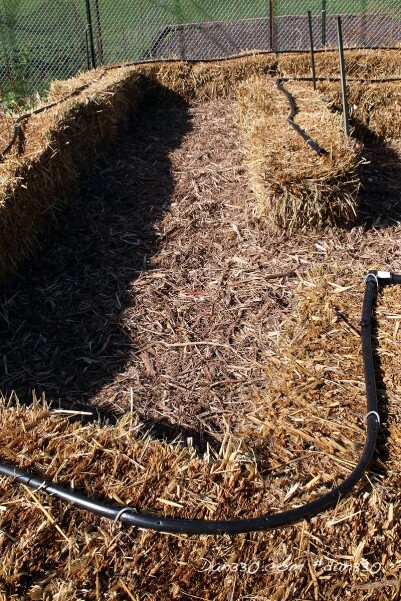 I wanted a subtle path that helps keep vine fruit out of the mud and help prevent weeds and grass from growing up in my new garden. 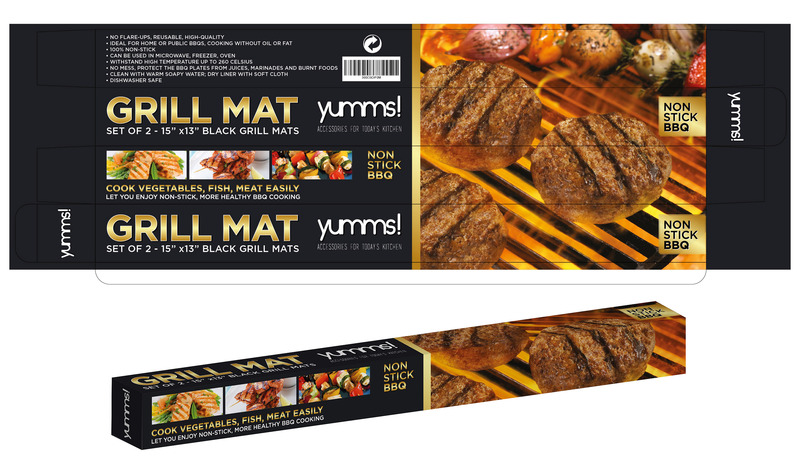 If you prefer, you could purchase a gardening weed barrier or weed cloth. However, I am doing this on a budget and have a lot of paper bags and newspaper I have piled up in a closet. 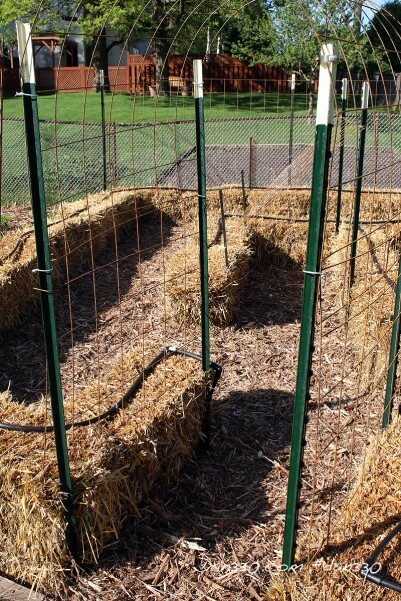 I will be laying them down on the dirt and covering them with free wood chips from my county. Honestly, I don’t know which will work better. 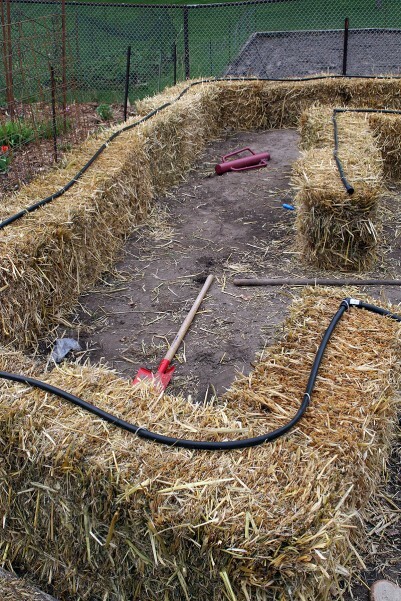 In his book, Straw Bale Gardening Joel Karsten suggests laying down a piece of plywood so it is easy to wheel a wheelbarrow. He says it is important to avoid using plastic because you don’t want the water piling up on top of the plastic. For more information on this, get Joel’s book. 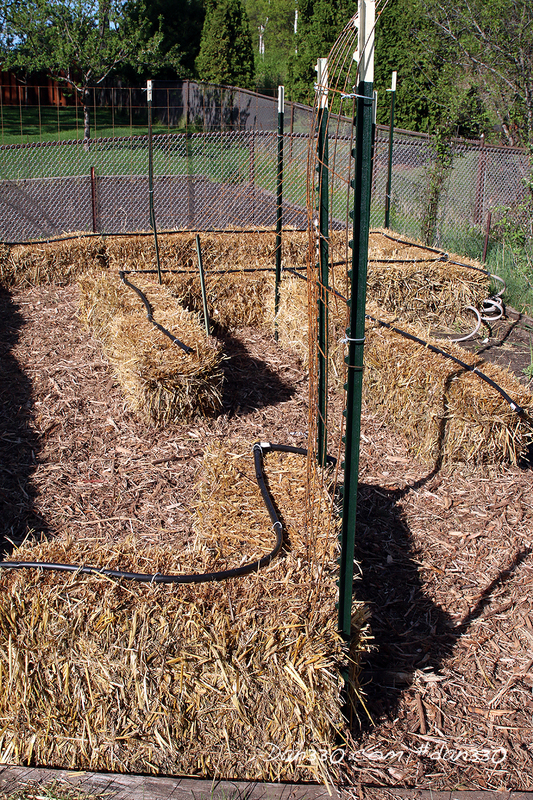 Here’s what the garden looked like before the path was set. 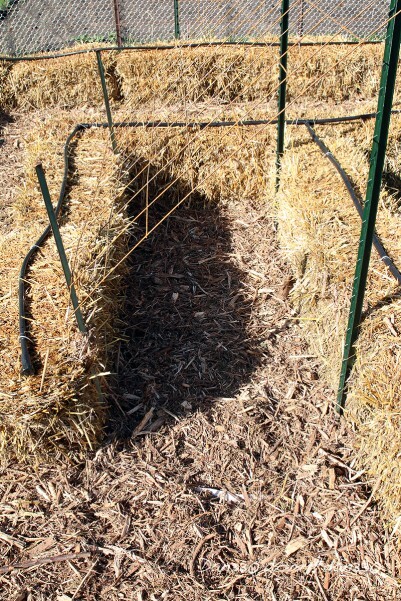 I took the newspaper and spread it on the path between the straw bales. I also put down some of the paper grocery bags I had. After another trip to the county compost site, I had another trailer full of wood chips. 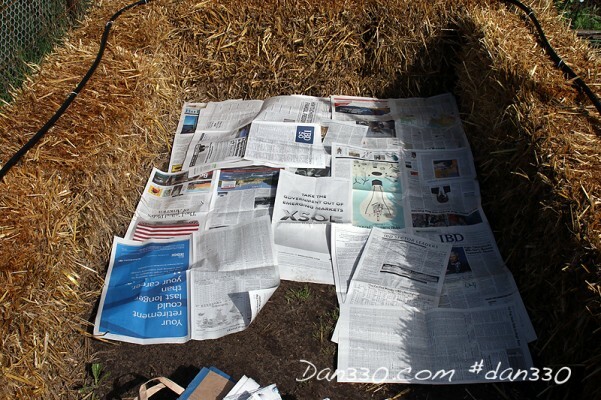 As I laid down the newspaper, I covered it with about four inches of wood chips. 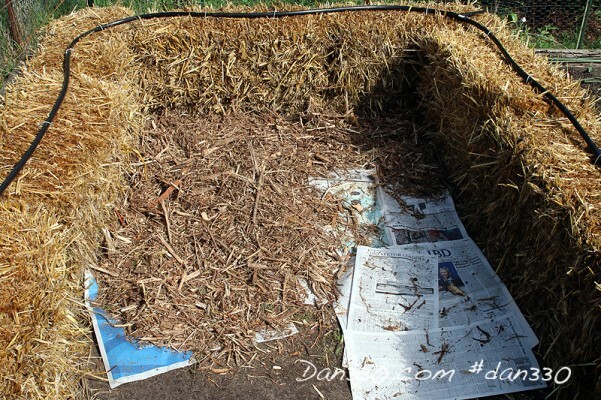 About half an hour later, I had the entire garden covered with paper and fresh wood chips. 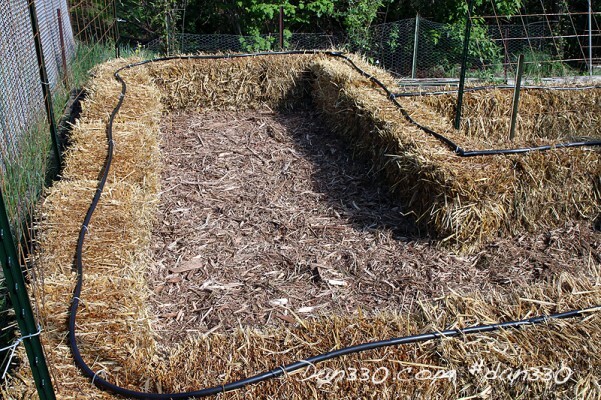 The wood chips will also make my new straw bale garden match my perennial garden and keep from tracking too much mud into the yard and ultimately my house. 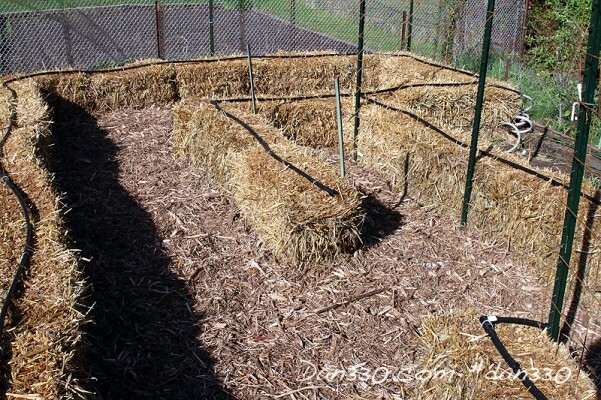 This is a very simple and free way to make a weed barrier and walking path in the straw bale garden. Doesn’t this look better! I am so excited to actually be in the garden without weeds and mud!